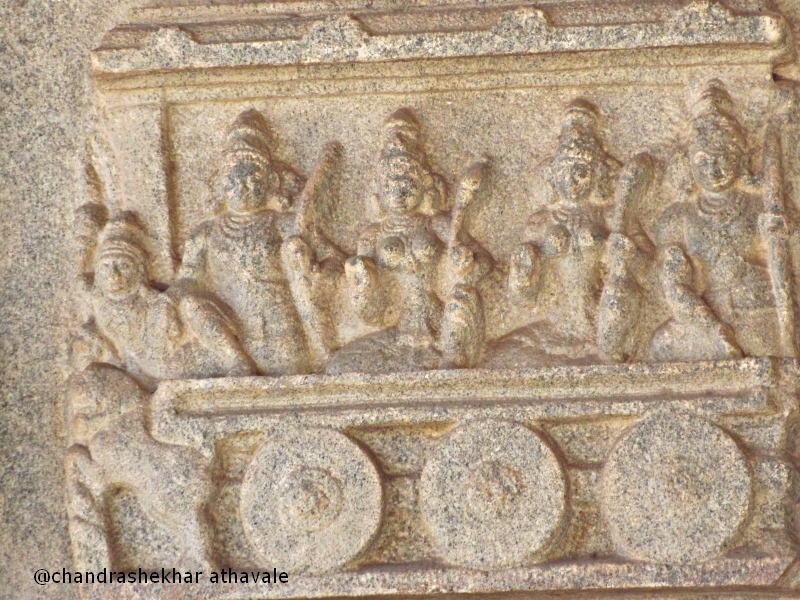 After visiting the Virupaksha temple, our bus is now leaving for another master piece of Hampi; The Bal Krishna Temple or the temple of Krishna as a child. 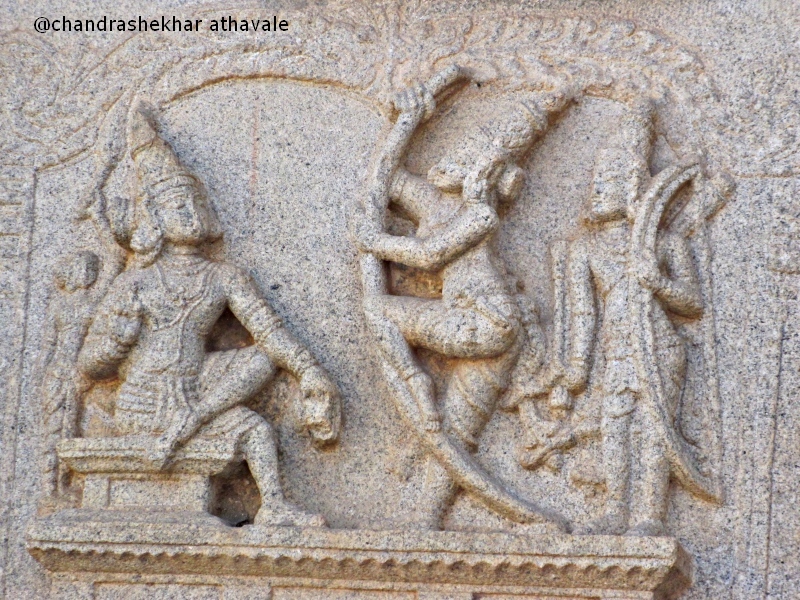 This temple was built in 1513 CE by Hampi king “Krishnadevaraya” to celebrate his victory in the war over king of Utkal ( Present day Orissa state). The temple is enclosed inside a compound barricaded by massive stone ramparts. 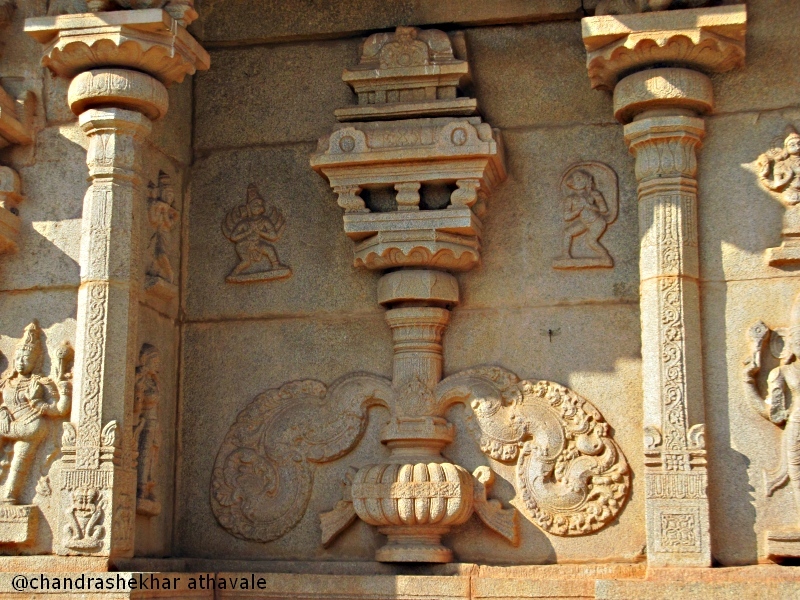 The main entrance gate is also constructed from stone. 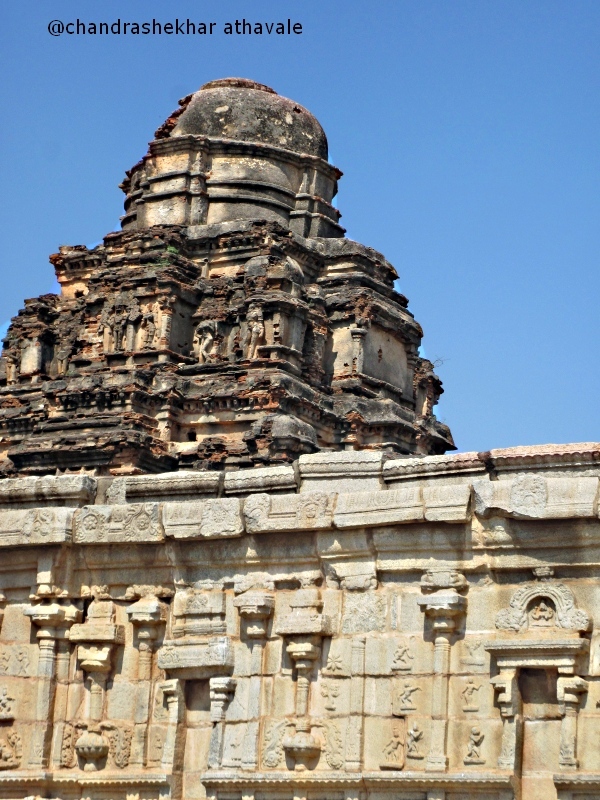 However, the tower above or Gopura, is of brick construction. 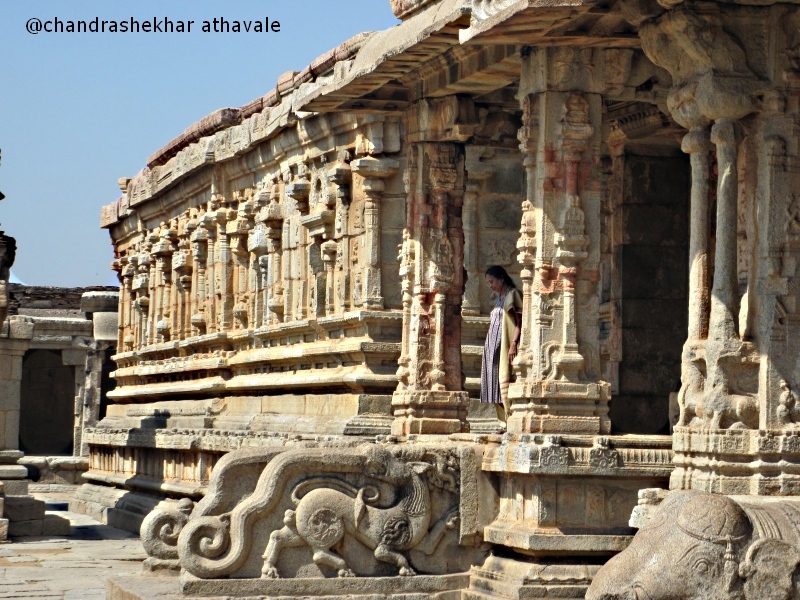 While standing at this entrance gate facing north, I glance at the view in front of me and try to imagine what it must have been like in the glory days of Hampi. In front of me is a huge water reservoir, which is completely empty now. On both sides of the lake, there are ruins of rows and rows of shops or stalls. The entire landscaping of this temple front has been done so well that it is fairly easy to imagine how picturesque and beautiful this must have looked then. All the shops here only dealt with merchandise that women love and desire, such as clothes, jewelry and ornaments. This area is still called with its original name of “Krishna Bazaar” only. 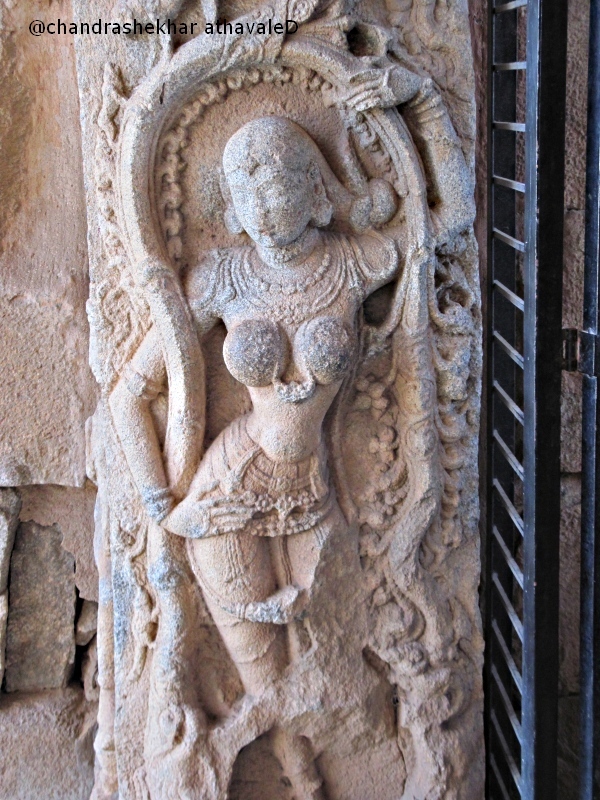 I turn around and my attention is drawn by some fine bass reliefs on the entrance gate to the temple. 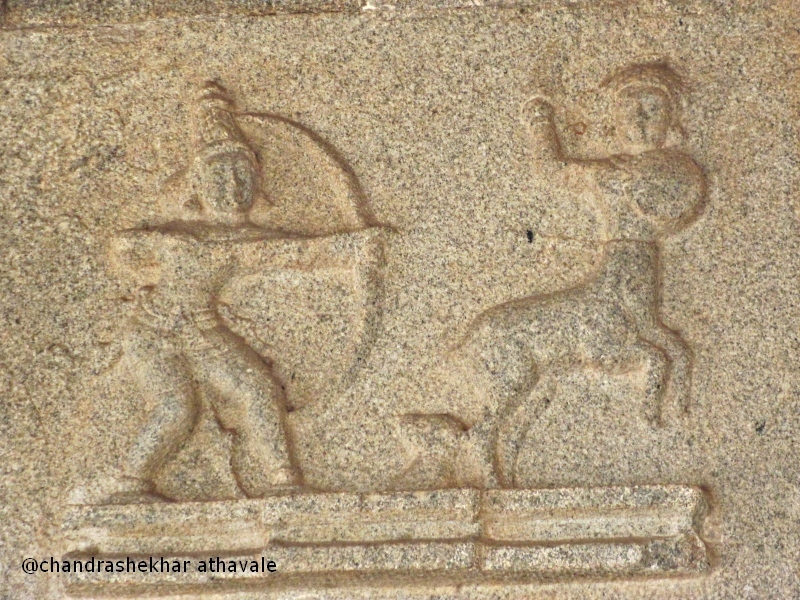 Besides a hunter female with a bow- removing a thorn from her sole, a meditating ascetic and a divine nymph-Apsara, there is also an inscription giving details about the victory won by the king and details of temple construction. 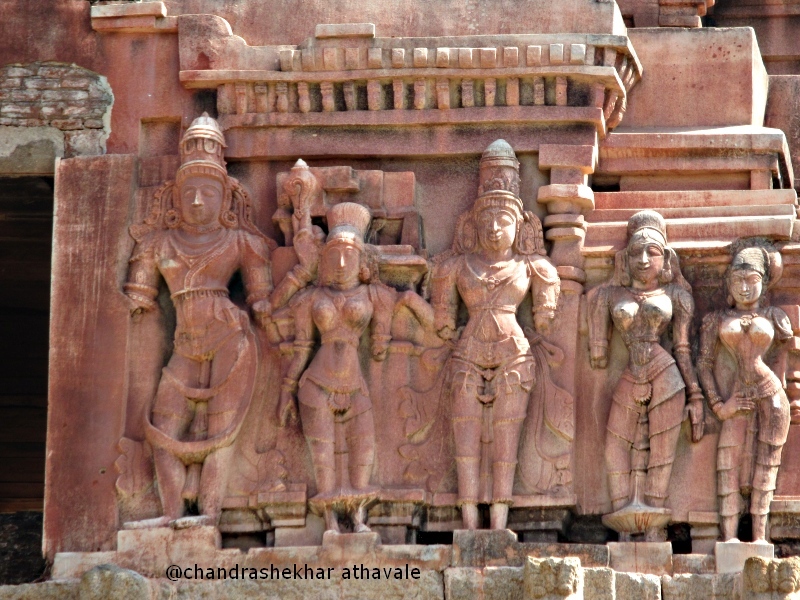 After entering the temple premises, I turn back and have a look at the tower above the entrance gate, as I had spotted some fine full reliefs there. 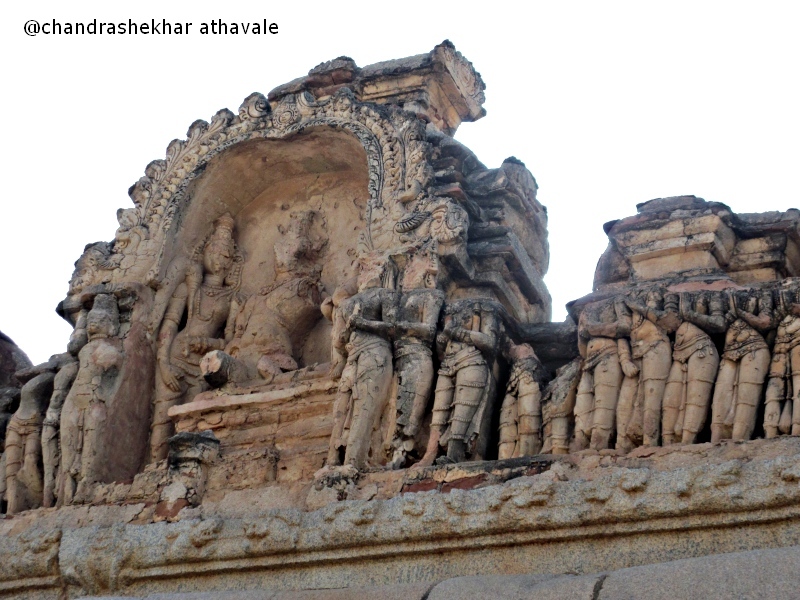 The figures are supposed to represent King Krishnadevaraya and his 2 official wives and a concubine. The temple hall, with highly decorated pillars, is huge. 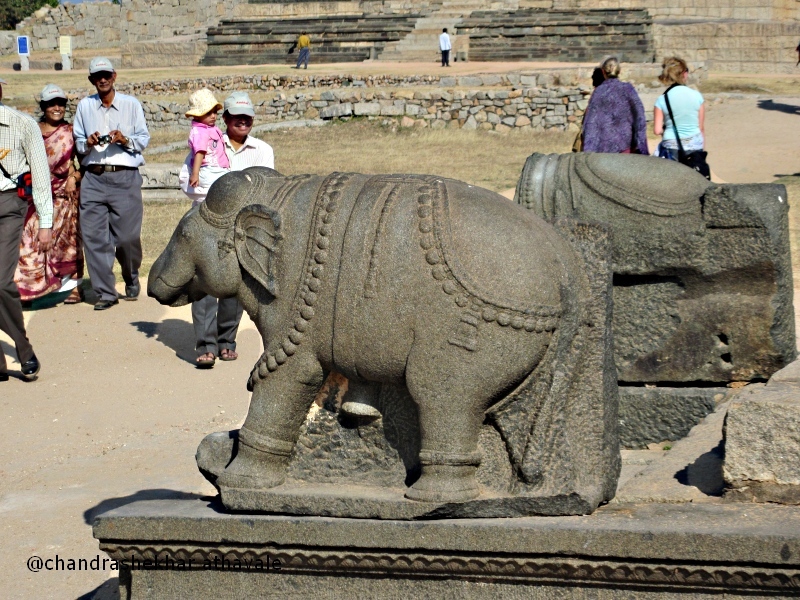 Two well crafted stone elephants, on both sides of the steps to the temple hall or “Rang Mandir” welcome me. Some of the pillars have bass reliefs depicting a lion faced animal called “Yali.” I realize that I am getting late and decide to leave. I want to have a last look at the tower on the entry gate. 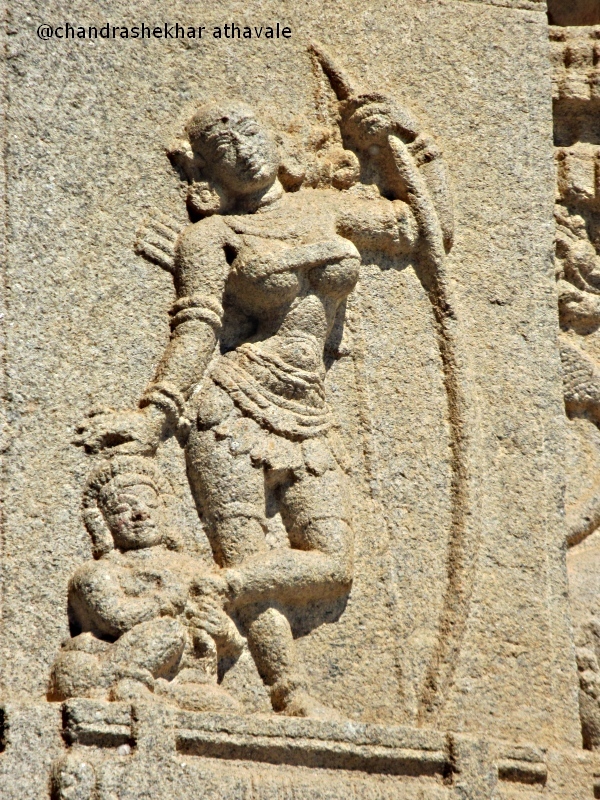 Right on top I detect a full relief human figure, which is intact. It is so high up that I need to use full zoom on my camera to snap it. Finally I succeed and get the picture of the beautiful relief. 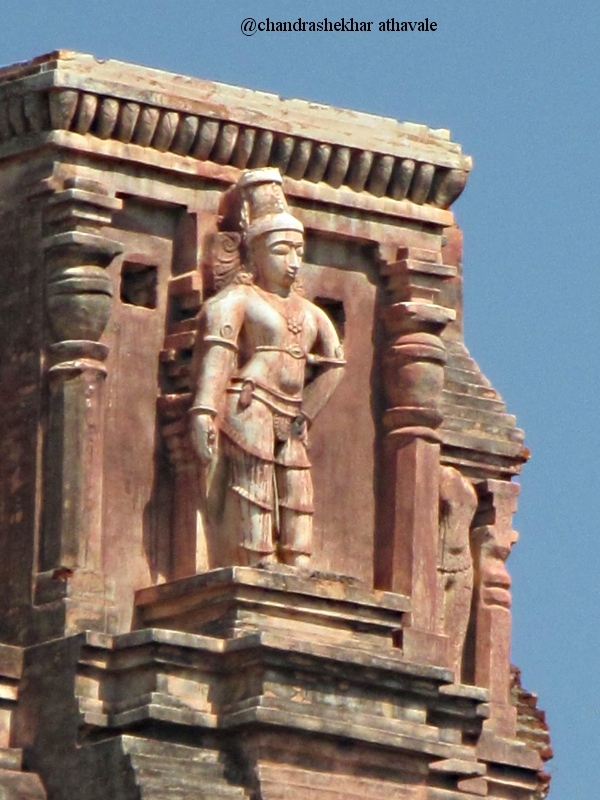 There are two smaller temples towards east of Bal Krishna temple. 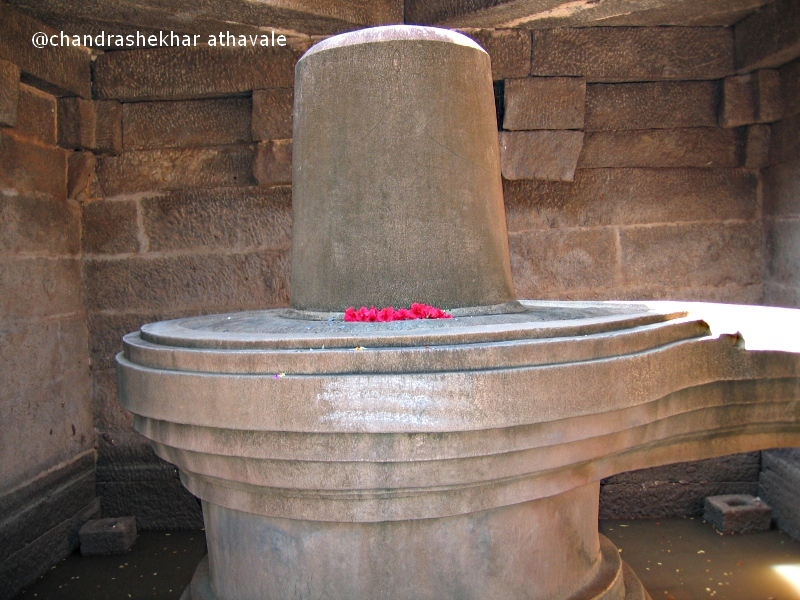 One of them is known as “Badawiling” and contains a huge Shiva Lingam as the name suggests. This temple was build just on a roadside so that votaries could pay easily their obeisance to the idol. 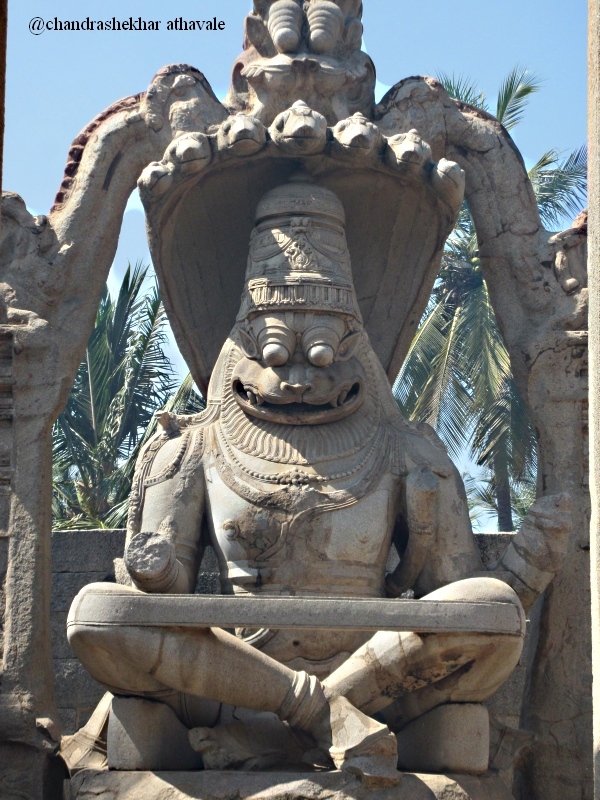 There is another temple of Lord Nrisimha in an angry mood, just on the side. To me, this idol appears very much like the cartoon character Shrek, but I keep my thoughts to myself. I am told that this temple was completely renovated by the Archeological Department, but when people objected to it, all the work done was undone and the temple now remains as it has been for last 500 years. I see two hand carts on the other side of the road. One of them is selling fresh coconut water. I decide to go for it as it is fairly hot with the sun blazing above. 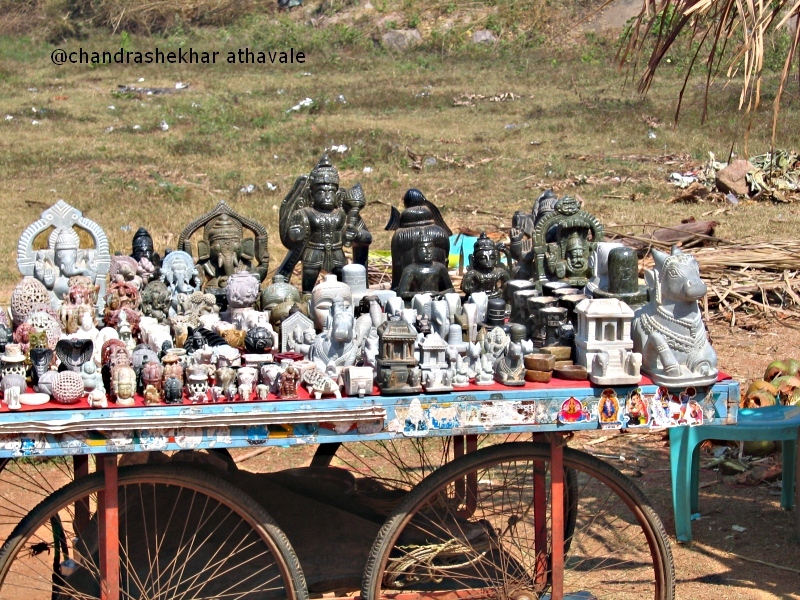 While drinking the fresh coconut water, I observe that the other hand cart has many small idols made from stone for sale. The prices however turn out to be as stiff as in a a big show room. I give up all thoughts of making a purchase and proceed further. 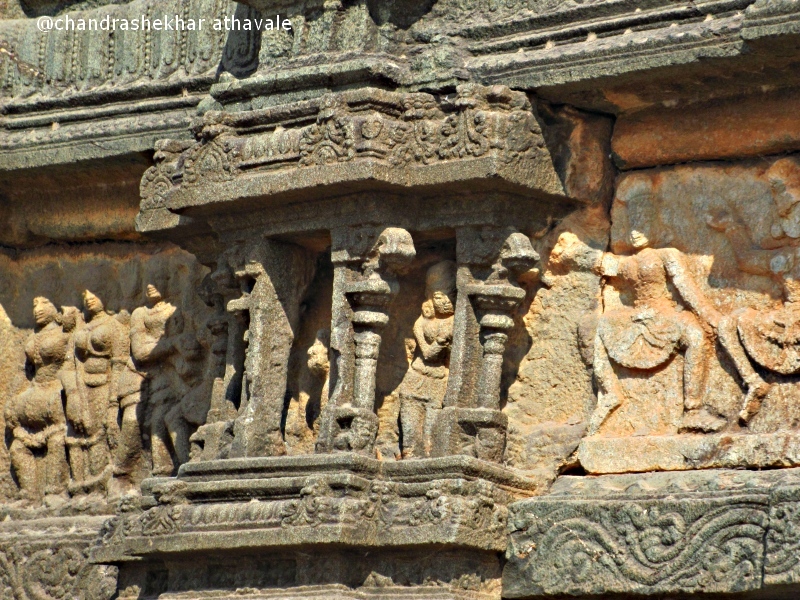 Most of the temples of Hampi are situated in the area, which I have so far visited. I am on my way now to the capital area which had King's and Queen's palaces and administration buildings etc. The first building, which I see on my way is a single storied squarish building without any roof. 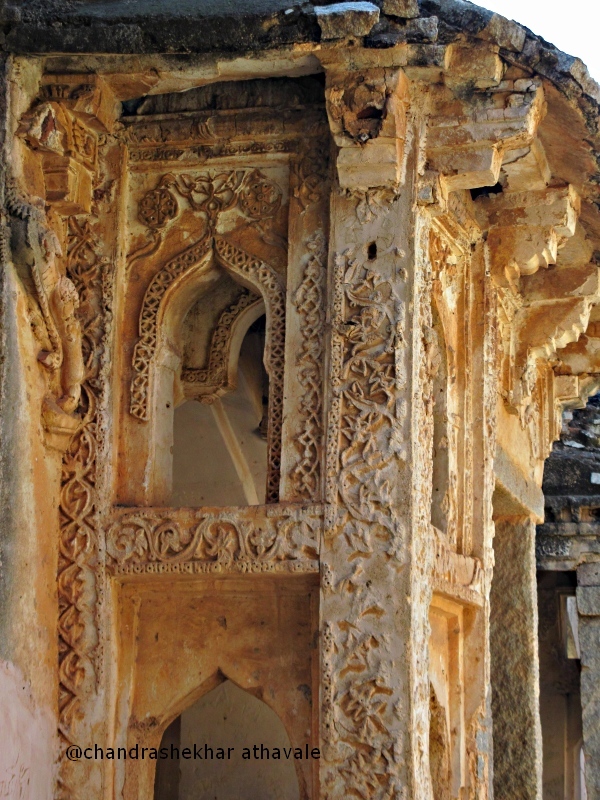 The arches on the entrance gate and small windows on sides are of typical Islamic style. A name board on the side says that this is the Queen's bath house. But after having a look it is apparent that this is actually a water sports center for the royal family. The building has a huge and built up square shaped water tub at center open to sky with roofed verandas on all sides. Fresh water inlets are provided on all sides with drain outs at the bottom. 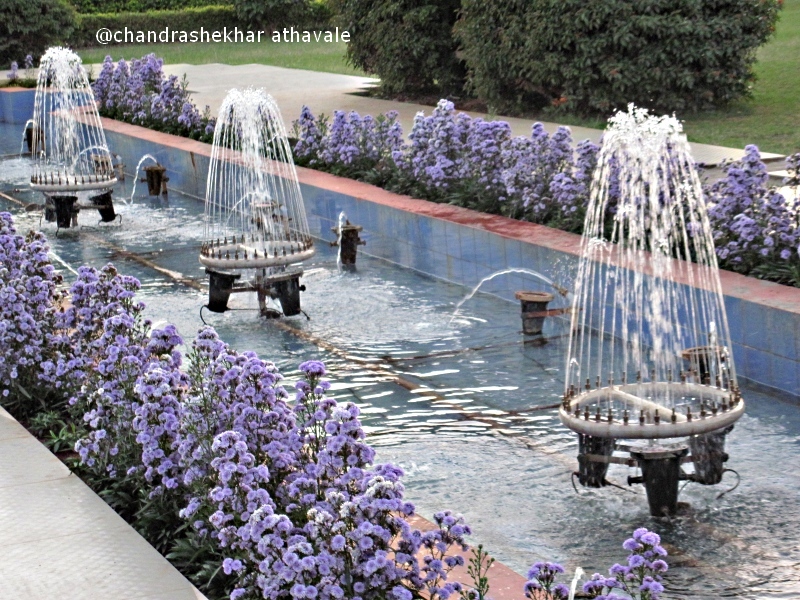 The water was kept scented with fresh flowers and perfumes. Female guards used to stand on the veranda roof, looking outward and if any intruder was noticed, he would be immediately arrested and thrown off in a water moat nearby. I can see beautiful designs in the plaster work on the sides of the tub and on veranda walls. These walls used to be covered with big silk curtains and a flag used to fly, when a member of the Royal family used the bath house. There is no doubt that this bath house must have looked stunningly beautiful during the glory days of the empire. As I come out of Queen's bath house, I realize that I am very hungry. I move to a nice restaurant nearby. After having good lunch, I relax in a cane chair. A cool breeze is blowing from the barren landscape around even with the sun blazing. My eyes close unknowingly. After a nap I get up for my next visit, which is to be to the King's palace. On way, I see two huge boulders lying is such fashion as it appears that they are embracing each other. 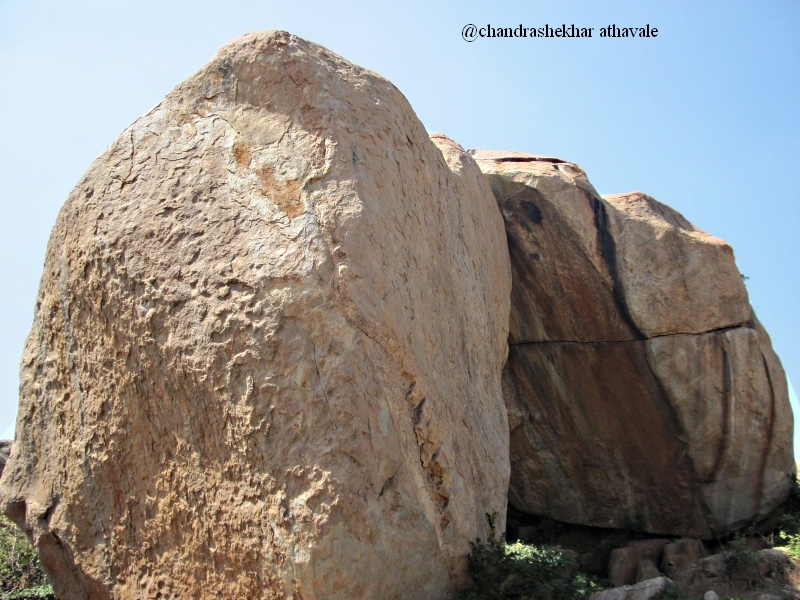 These rocks are known as “Akka tangi gundu” or twin sisters. 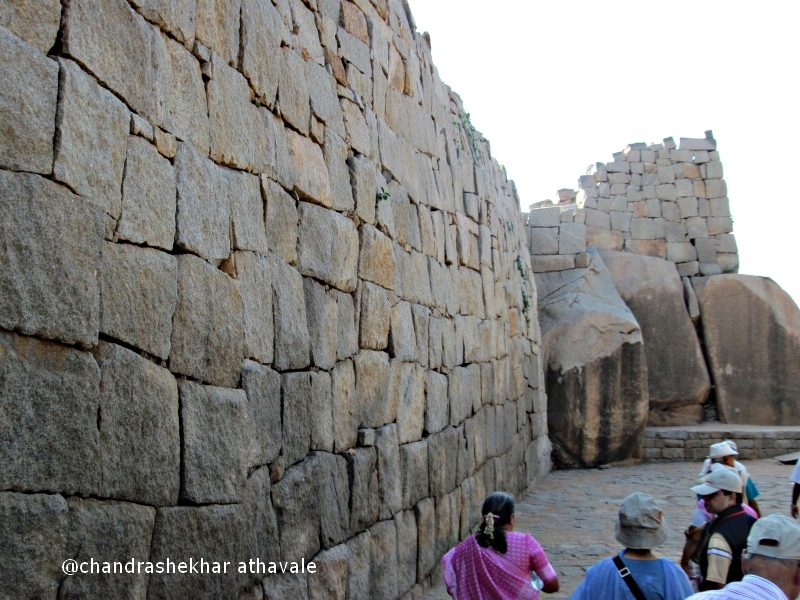 After travelling some distance further, I see a huge wall built from giant stone bricks. These bricks were individually chiseled to fit each other. The wall has no gaps and no binding material such as mortar lime was used. The wall is about 12 to 15 feet wide at the bottom and as tall as 36 feet at some places. 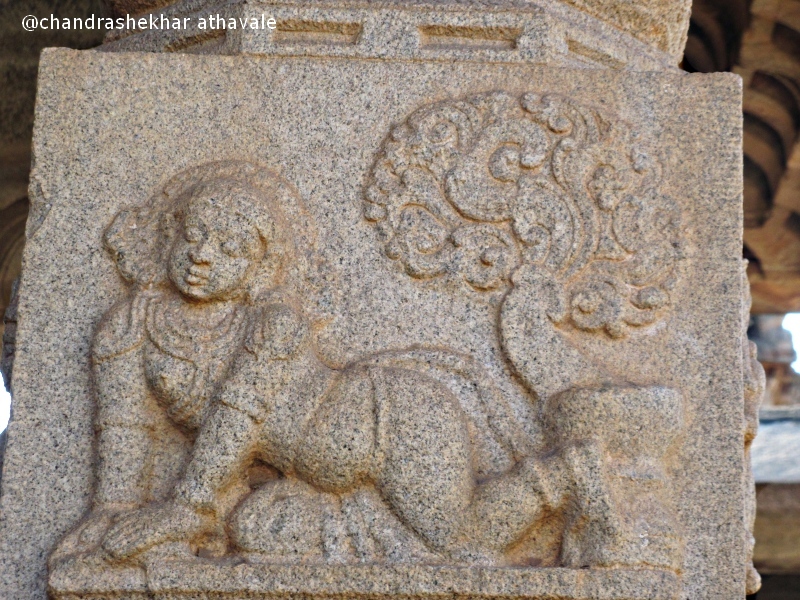 Archeologists say that Hampi had 7 such protecting walls around the city. The wall surrounding the King's palace was naturally the strongest. 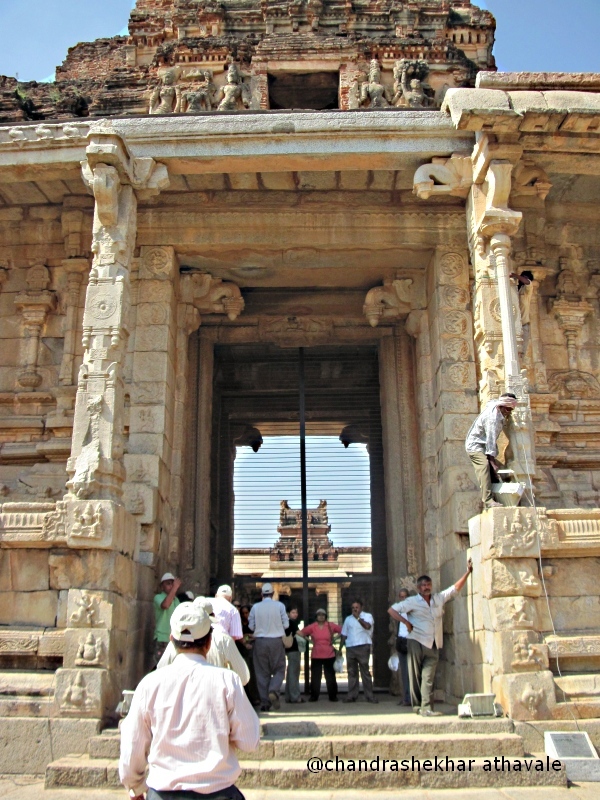 The door panes of the main door were constructed from solid rock slabs and moved with two stone pins rotating in the sockets provided in the stone sills. An arrangement very similar to a ball and socket joint. The door panes are lying on a side. It was possible to close or open this door only with an elephant's help. 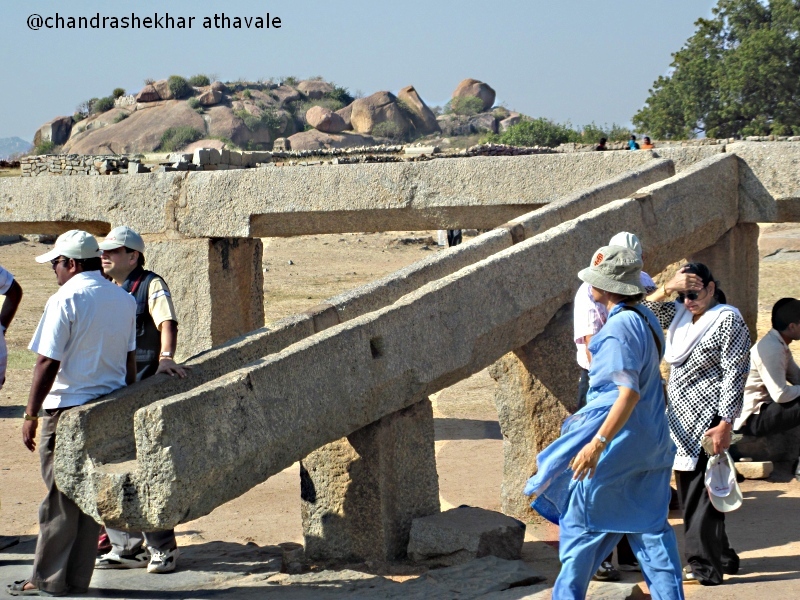 No wonder that with this kind of massive security, Kingdom of Hampi stood onslaught of Islamic armies for 200 years. I enter the palace ground through main entry door. 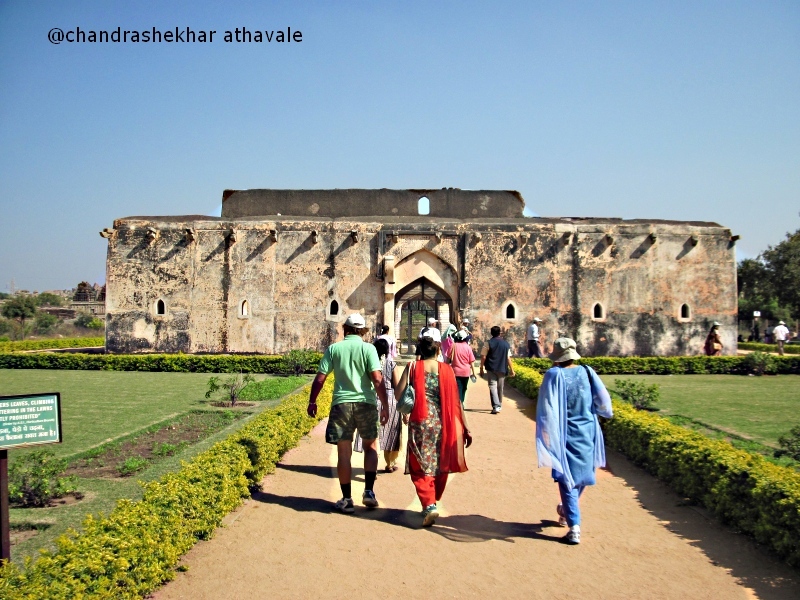 The scene inside is very similar to Shaniwarwada, a place of historical importance from my home town Pune. I see everywhere, only plinths of buildings built from stone bricks. Boards have been erected near all such ruins explaining, what buildings stood there once. 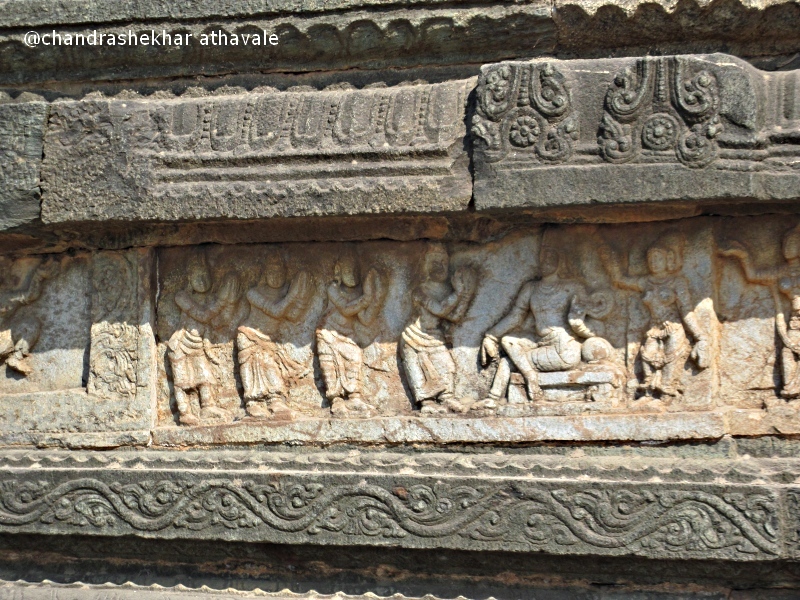 King Krishanadevaraya's palace made from sandal wood, the Darbar hall with 100 pillars are all destroyed. A secret enclosure for King's consultations with his spies, exists is good shape. 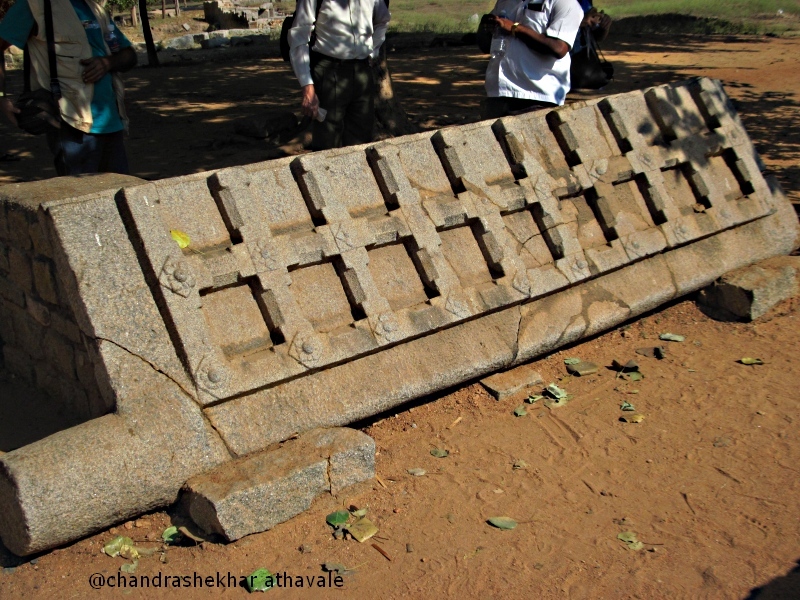 A large stone brick platform known as “Mahanavami Dibba” has somehow survived the ravages of time. 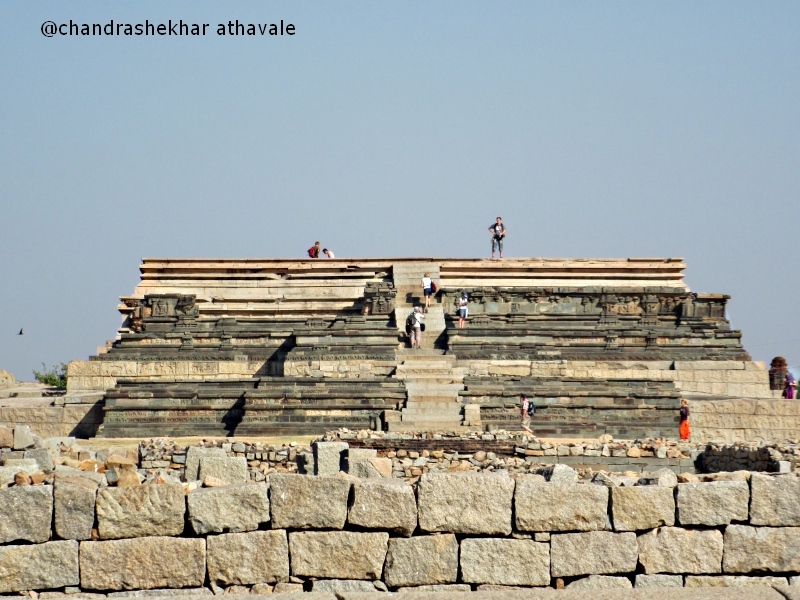 This 25 feet high platform has been a mute witness to each and every major celebration done in Hampi. The platform has a stepped construction. 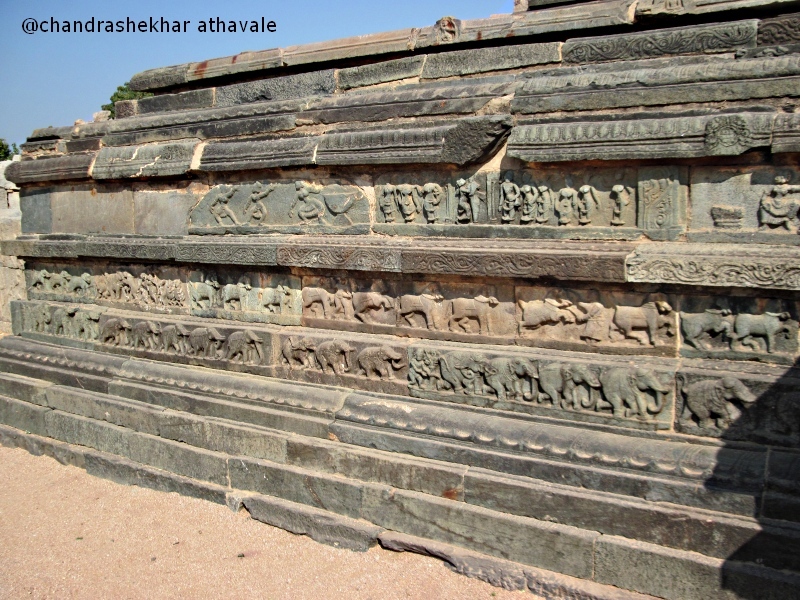 A flight of steps in front and on two sides, have green granite stone panels with beautiful bass reliefs, depicting king's court scenes, life of people, horses and elephants. 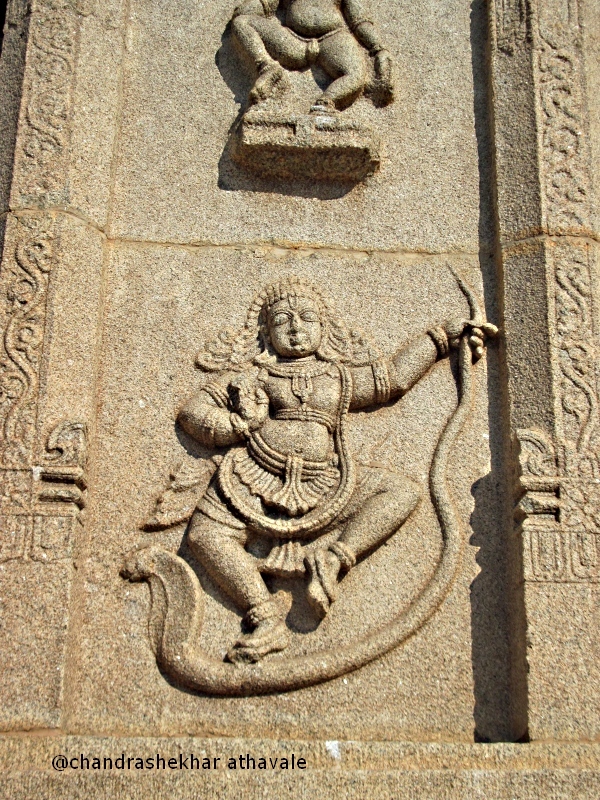 On one of the sides, the bass reliefs only depict female warriors. This platform can be seen without any visit fee but it is definitely worth seeing. King used to sit on this platform and watch various sports events, march pasts and festival programmes. The stairs in the front appear bit stiff but stair case at the rear, which was used by the king, is easy on the legs. In the various events organized to celebrate festivals, there used to be an eating competition. 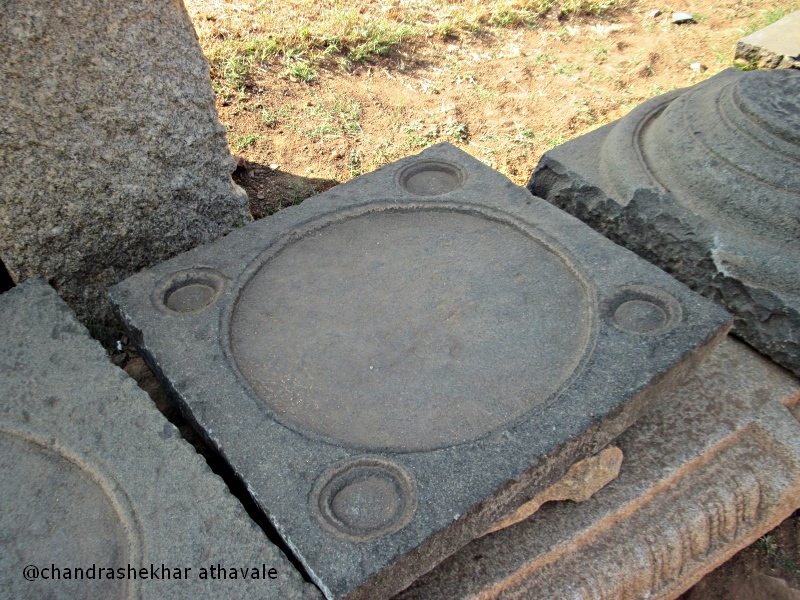 Special giant sized plates made from stone were used in these contests. 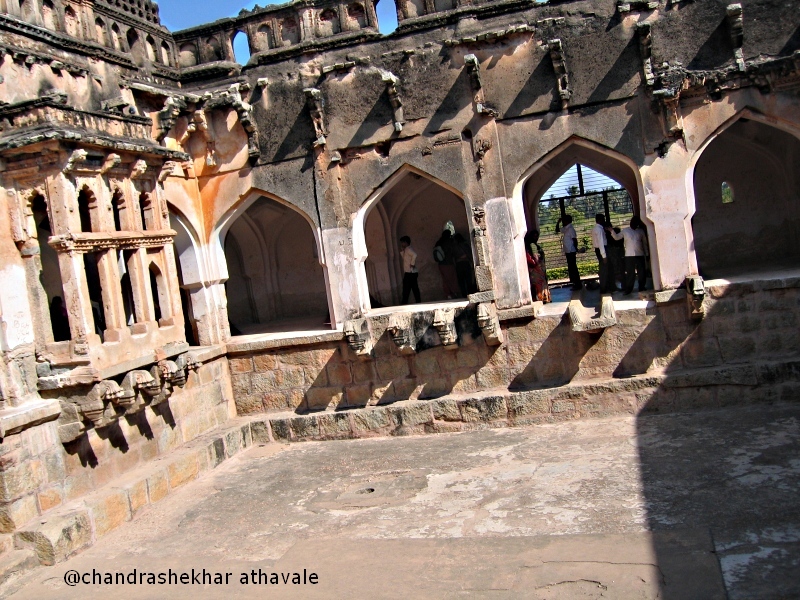 All the royal buildings were supplied running water through U shaped channels made from rocks. I can also see a large sized water reservoir with steps on all sides. I now walk towards the rampart on the northern side. 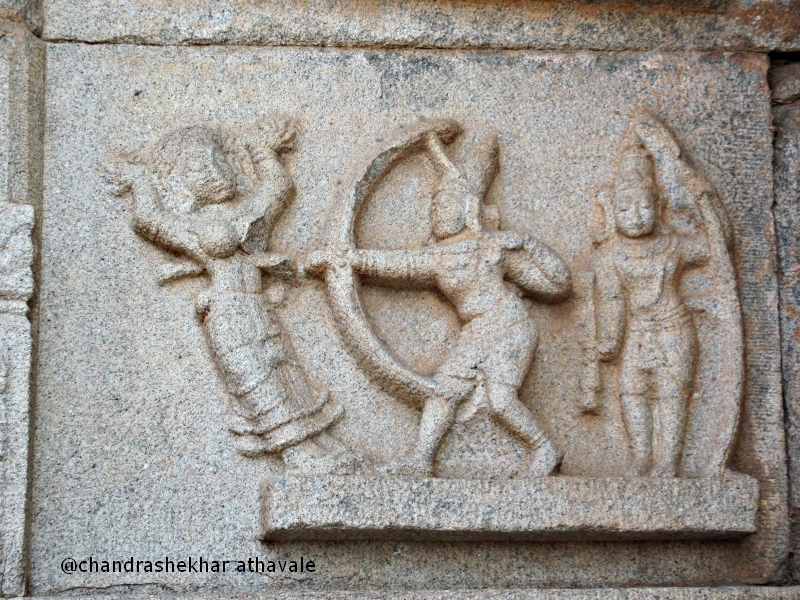 A temple known as “Hazari ram “ or temple of 1000 Rama idols, exists just near the northern boundary of palace grounds. 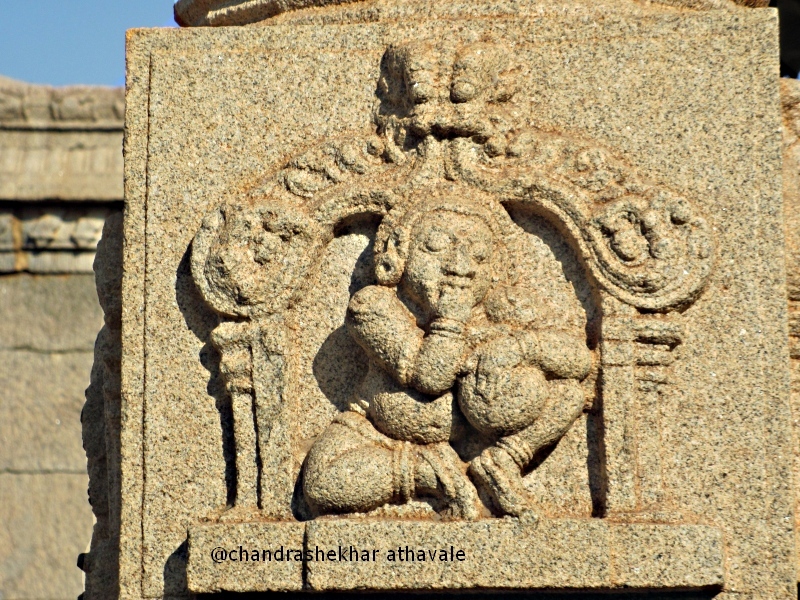 Some of the best bass reliefs found in entire Hampi area, are found here. 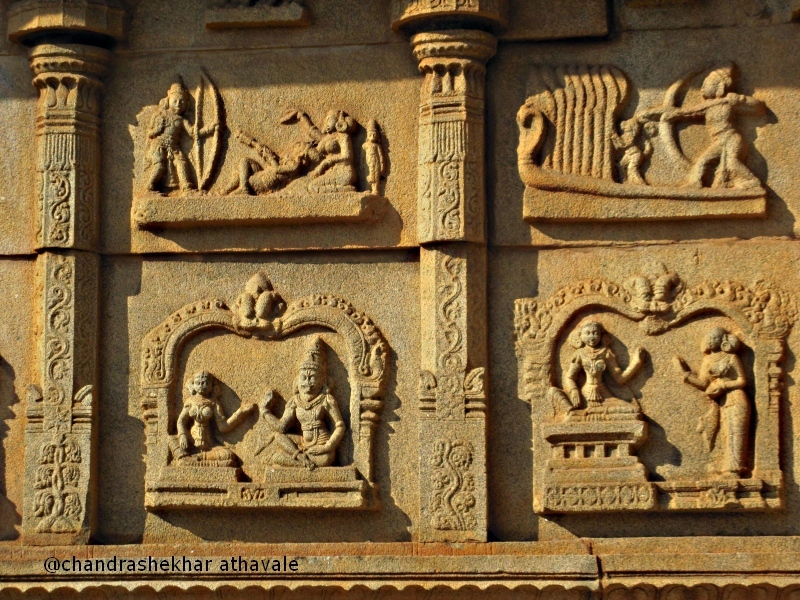 The pillars of the temple hall, outer and inner walls, are all studded with wonderful sculptures. 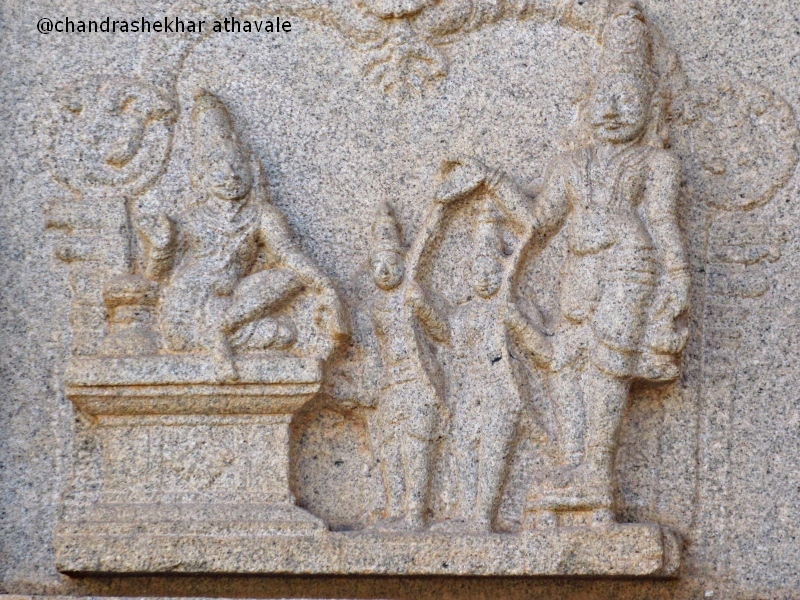 Some of the reliefs are very funny too. 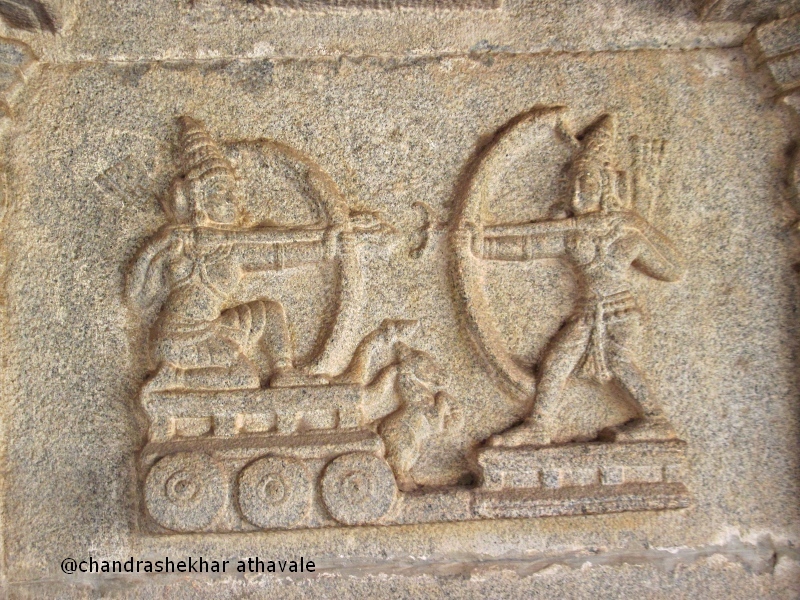 A tram car for the Gods or Krishna as a child trying to steal butter are just unbelievable. To light up the temple with lights, decorated engraved lamps are carved at many places. King Rama meets his sons "Lava" and "Kusha"
Rama kills a female demon "Shupanakha"
Krishna kills the evil serpent "kaliya"
I look at the watch. It is already 5 in the evening. 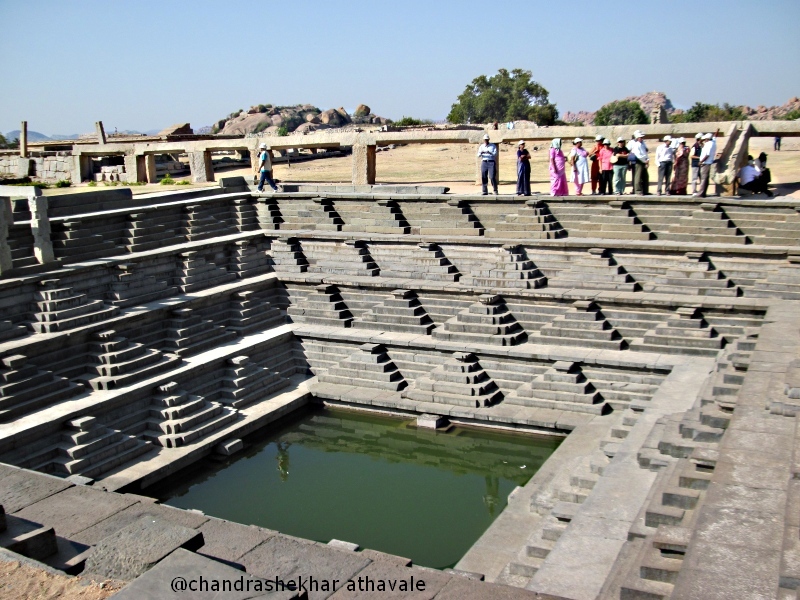 This means that I have been wandering all over Hampi ruins, in blazing sun, for last 5 or 6 hours. Still what I have seen in that time is something unique and can not be seen very often. I am not feeling particularly tired, so I decide to travel to a garden near the dam on Tungabhadra river, to spend the evening. After reaching the spot, I find that the shuttle bus, which would take me up to the dam is not playing today. 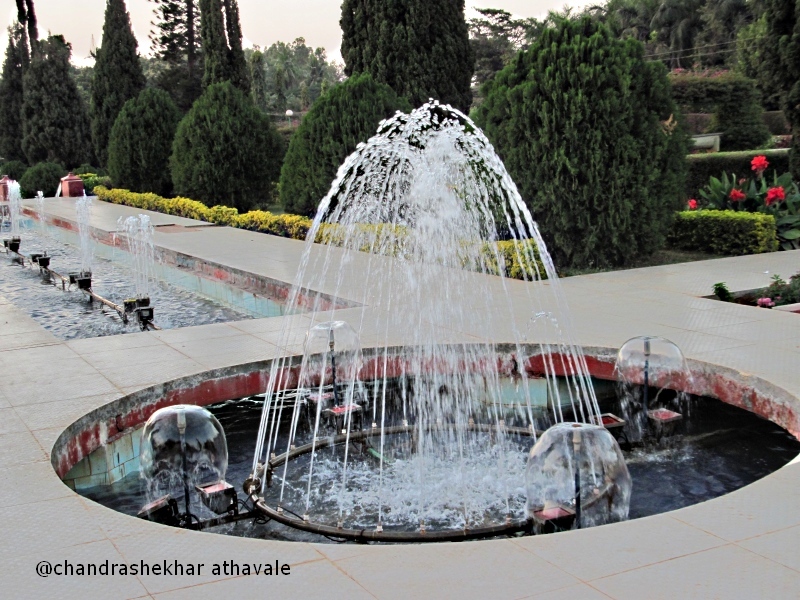 So, it is another long walk and then down again to the garden, which is almost a replica of Vrindavan gardens near Mysore city. Similar fountains with coloured flood lights and jets of water dancing to music, are very comforting for my tired condition. Later, as I retire for the night, I wonder, how did I manage to walk so much today? 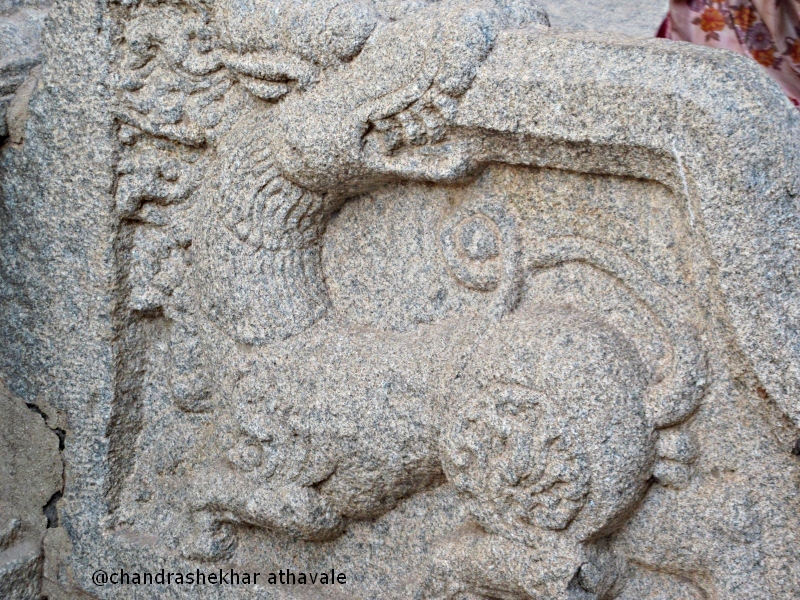 Perhaps it was the magic of Hampi after all. 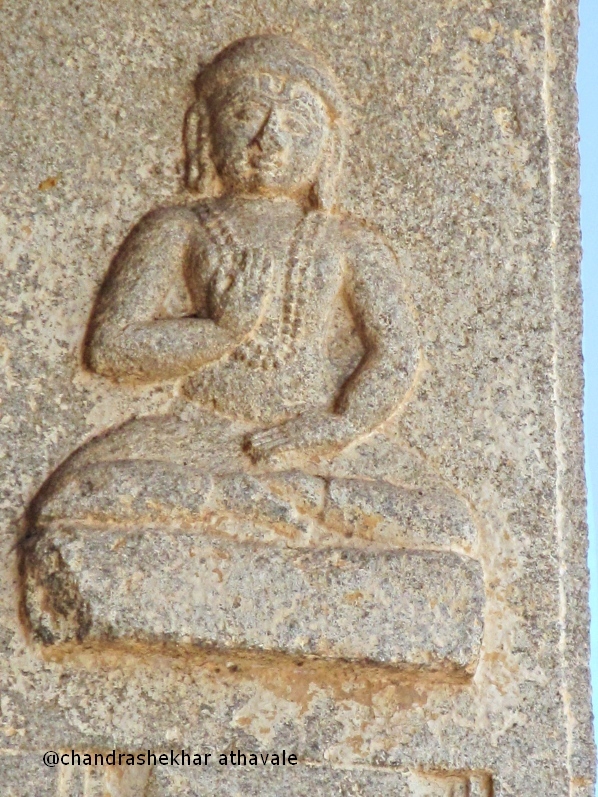 Tomorrow I visit the greatest attraction of Hampi, the famed temple of “Viththala.” With a great expectation for tomorrow, I fall asleep in no time at all.